The Children's Hospital entrance will be closed for the duration of construction. 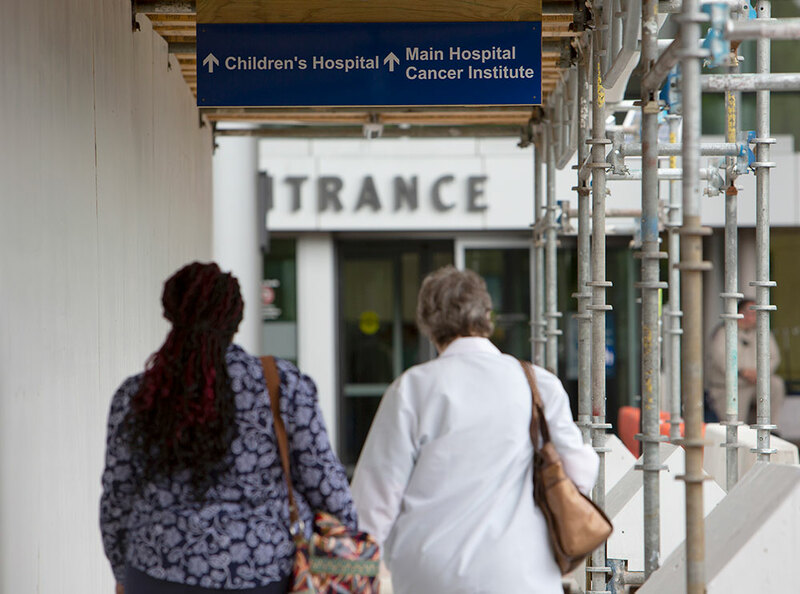 Patients and visitors should use the HMC Main Entrance, and then can get to the Children's Hospital from there. Be advised that, due to construction, vehicle traffic will not be able to access the front of the Children’s Hospital. University Drive will be closed just after the Main Entrance to the Penn State Health Milton S. Hershey Medical Center, with a temporary access route to the intersection with Centerview Drive. Due to the road closure, various services and functions are being moved to different entrances or parking lots. Those trying to get to the Children’s Hospital should use the Main Entrance at HMC, and then can travel through the building to the Children’s Hospital. Below the map is a textual description of all the changes. The best way to get around to different buildings on our campus is always via our complimentary Shuttle Service, which has regular stops at the Centerview Parking Garage, various spots in our parking lots, University Physician Center, HMC Main Entrance, North Entrance, 30 Hope Drive, the Academic Support Building, and the College of Medicine. The HMC Main Entrance will serve as the entrypoint for HMC patients/visitors, as well as those wishing to go the Children’s Hospital. Valet service will still be available at the HMC entrance. If you’re looking to travel between the University Physician Center and the HMC or Children’s Hospitals, we recommend that you use our indoor pedestrian bridge. Walk down the main hallway until you see the sign for the Radiology Elevator. Take it to the second floor. The hallway will force you to take a left, and you’ll be along the outside of the building. After a short distance, you’ll see the (indoor) pedestrian bridge on your right. Walk across it. The bridge will deposit you near Entrance 4 at the UPC. If you need to get to another entrance, you can either walk outside the building and re-enter, or just follow the hallway at your left, which will get you to the entrances in descending order (3,2,1). Go to Entrance 4 (or, if you’re at another entrance, travel in the direction away from the parking garage), and look to your right. You should see a long hallway and the pedestrian bridge. Go across the bridge until you reach the back of the Main Hospital. Take a left at the end of the bridge and continue going. Go straight until you get to the first junction, where you’ll want to take a left. You’ll want to continue straight until you see a sign for the Radiology elevators. Take the elevators to the first floor. After emerging from the elevators, take a left in the main hallway to get to the HMC Main Entrance.